We hired DJ Zinn for our wedding and he was amazing! He kept the dance floor packed the whole time with his selection of hits that pleased every generation there! He knows how to keep the party going strong and he is very professional. Thanks, DJ Zinn! “I used Dj Zinn for my corporate event and couldn’t be happier. This guy is a genius, he can spin all varieties of music. “This braddah did a great job. The importance of a good DJ at a wedding is one that shouldn’t be overlooked. makes the night go easier and less worries in the long run. I didn’t have too many requests but whatever i asked DJ Zinn to do he was more than happy to oblige. All the songs i requested were available and he had great song selection on the time slots i left it up to him to decide. Professionalism and DJ ability aside, the most important aspect to me was that he had tons of Aloha. He was a very warm and good natured person to be around. and to me that means a lot. I don’t need someone to stick out like a sore thumb and be in my mind constantly on my big day. He made me feel like i could trust him and not worry about him looking, saying, or doing something stupid. and i was right. “Wow! What a party. I just celebrated a birthday with a fellow friend Luis. We both been trying to throw a double birthday bash for years now. We finally did it on the beach here on Maui in Kapalua (DT FLEMINGS). It was amazing! All due to the magical sounds and performance of DeeJay Zinn and Sheryl G. I’m not kidding. I’ve known Daryl for 20 years and he’s always been a musical genius. He really BROUGHT IT! From the state of the art sound system and his uncanny ability to play all the right songs at the right time for all ages. We were dancing non stop for hours. Everyone had a blast. From the 2 year old toddlers to the 82 yr old friend visiting from California. Hawaiian, Motown, blues, reggae, rock and all the hits from past to present. 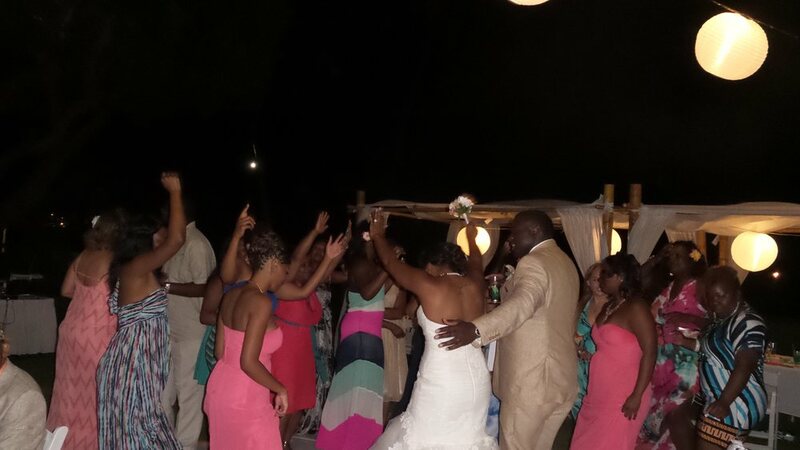 “We had our wedding reception at Capische in Wailea and DJ Zinn definitely kept the party jumping! He had a full dance floor of kids up to 85 year olds (and everything in between) and he had everyone dancing all night. DJ Zinn has an unbelievable ability to read the crowd and play the appropriate music at the right time and, his mixes were fantastic…he played all the music we requested at exactly the right times and mixed some of our old school jams seamlessly with new school music to make it all flow extremely well. We would highly recommend DJ Zinn for any function – he was great to work with, flexible, very responsive to our requests/changes and very easy to communicate with.